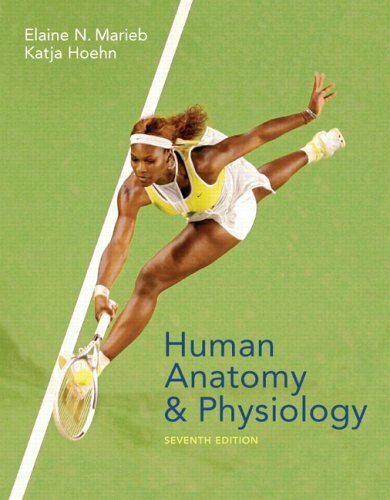 Human Anatomy & Physiology, 7/e 2006 | Free eBooks Download - EBOOKEE! Posted on 2007-10-07, updated at 2016-11-25. By anonymous. KEY BENEFIT: With each edition of her top-selling Human Anatomy & Physiology text, Elaine N. Marieb draws on her own, unique experience as a full-time A&P professor and part-time nursing student to explain concepts and processes in a meaningful and memorable way. With the Seventh Edition, Dr. Marieb has teamed up with co-author Katja Hoehn to produce the most exciting edition yet, with beautifully-enhanced muscle illustrations, updated coverage of factual material and topic boxes, new coverage of high-interest topics such as Botox, designer drugs, and cancer treatment, and a comprehensive instructor and student media package. The Human Body: An Orientation, Chemistry Comes Alive, Cells: The Living Units, Tissue: The Living Fabric, The Integumentary System, Bones and Skeletal Tissues, The Skeleton, Joints, Muscles and Muscle Tissue, The Muscular System, Fundamentals of the Nervous System and Nervous Tissue, The Central Nervous System, The Peripheral Nervous System and Reflex Activity, The Autonomic Nervous System, The Special Senses, The Endocrine System, Blood, The Cardiovascular System: The Heart, The Cardiovascular System: Blood Vessels, The Lymphatic System, The Immune System: Innate and Adaptive Body Defensives, The Respiratory System, The Digestive System, Nutrition, Metabolism, and Body Temperature Regulation, The Urinary System, Fluid, Electrolyte, and Acid-Base Balance, The Reproductive System, Pregnancy and Human Development, Heredity For all readers interested in human anatomy & physiology. This book came in quickly. It was in excellent condition, and I received all of the supplemental learning items that came with the book. The book was a part of a college book list. The item was reasonably priced and delivery time was quick. Book was received quickly, only after i called customer service and i told them that i wasn't waiting 3-4 weeks for delivery. They were going to deliver it in October, around midterms.. and that just wasn't a possibility for me, so i called customer service, the man was very nice and helpful and he got my book to me in about 4 days. Book was in great condition and is very helpful in my class. This textbook is easy to understand and read. Makes it easier to read than previous biology classes I've had before. It's very descriptive and goes into great detail. No comments for "Human Anatomy & Physiology, 7/e 2006".